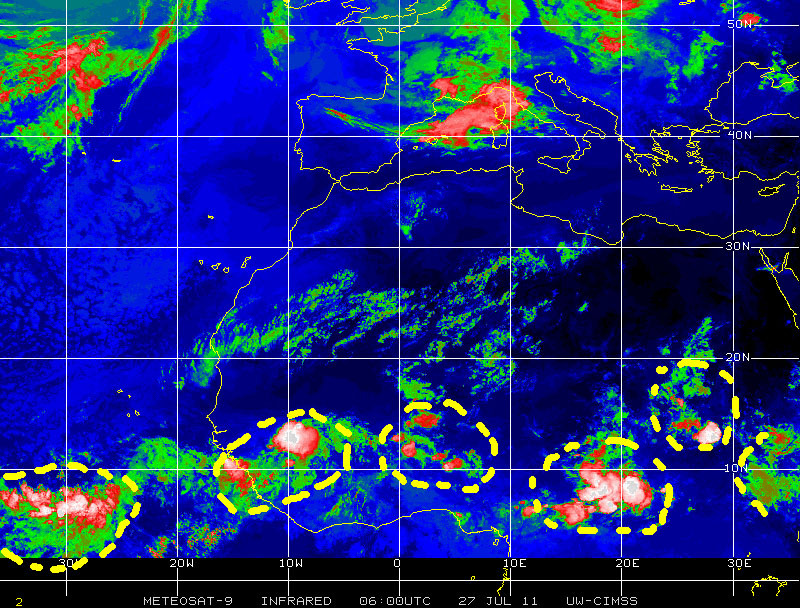 Some ten days ago, around September 26 or 27, a couple of disturbed weather cells formed in the southeastern Caribbean to the east of Costa Rica and Nicaragua, just as we were monitoring tropical cyclones KIRK and LESLIE in the Atlantic basin. Although relatively small, these disturbances caught my attention mainly because of their location and a surrounding favorable ocean-atmosphere environment in the Caribbean, the Gulf of Mexico, and the East Pacific waters off Central America. On that basis I tagged this cells for further monitoring. Sure enough, these disturbances in the Caribbean congealed into a large stormy weather cell just as a disturbance over the east Pacific also grew. 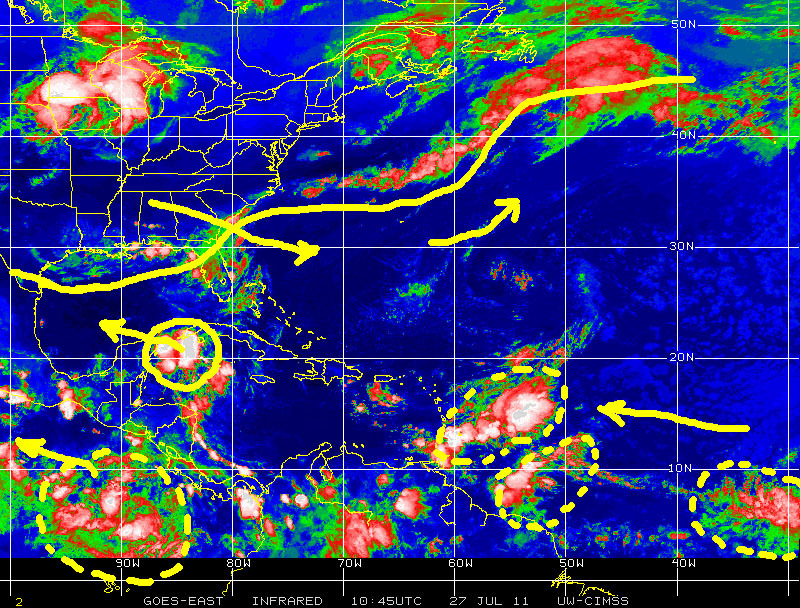 The interaction of these systems generated heavy rains in Panama, Costa Rica, and Nicaragua, and eventually over an entire region from northern Colombia to southern Mexico. In Nicaragua’s Pacific coast region it has rained daily for the last ten days. In Managua, the capital city, and other areas they have had up to 100 mm (4″) on rain per day for the past 3 – 4 days. Widespread flooding has taken place throughout the country. Civil Defense authorities issued a Red Alert for several municipalities. In some areas the ground was so saturated that water was coming into houses from the ground up through the floor. Reports of heavy damage and at least eight dead are evidence of a potential disaster in the making. Other countries in the region, especially El Salvador and western Honduras have suffered similar impacts. 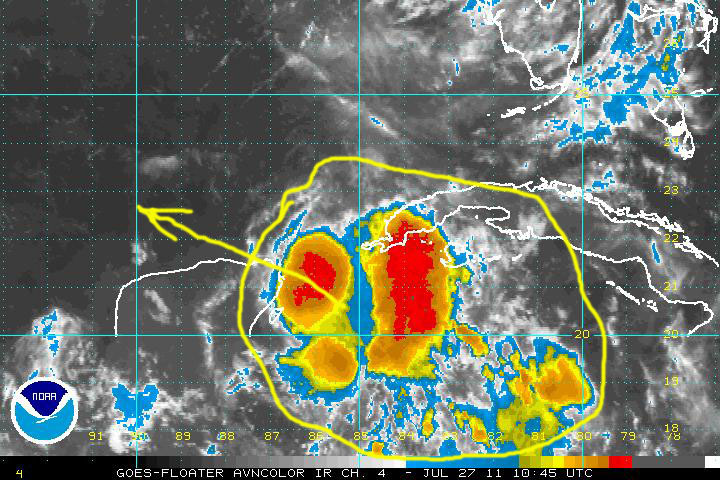 Collaterally with the deluge over Nicaragua and devastation over the entire region, the tropical disturbance in the Caribbean has continued to grow and get better organized as it moved generally northward near the coast of Nicaragua, Honduras, and Belize. Today, Sunday 7 October, this system if off the coast of the state of Quintana Roo, Mexico, in the Yucatan Peninsula, and has been classified as tropical depression #14 of the 2018 Atlantic Hurricane Season. The storm is rather large, generating torrential rain over a wide region of the northwestern Caribbean, and it is showing strong cyclonic tendencies as it progresses toward the Gulf of Mexico where surface water are rather warm at around 30 Celsius. Given these aspects and the favorable environment around and ahead of the storm, it is highly probable it could become a tropical storm within the next 12 – 24 hours, and entirely possible that it may reach hurricane strength once in the Gulf. The storm’s current projected track, which takes into account numerous factors over a wide region that will influence it, has the storm starting to turn toward the northeast once it reaches the south-central Gulf. This means Florida is within the projected track and needs to monitor this system closely starting now, especially along the central-northern Gulf coast and the Panhandle. While the priority now is Tropical Depression #14, we also need to monitor several tropical waves and stormy cells currently moving westward along ‘hurricane alley’ and to the north of Puerto Rico. as well as others over Equatorial Africa. There is plenty of hurricane season still left in 2018 in the Atlantic basin and elsewhere. Hurricane SERGIO is forecast to turn northeastward toward the Baja California peninsula for a repeat impact on Northwestern Mexico and the Southwestern USA, which were hammered with wind and torrential rain from ROSA just a few days ago. Remain alert. Be prepared. MITIGATE! 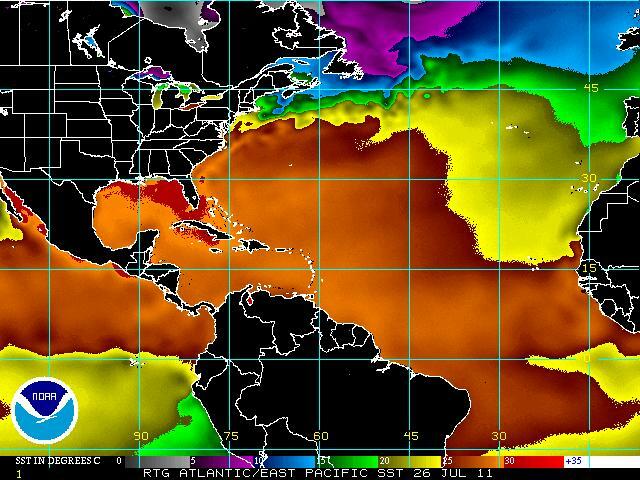 2011 Atlantic Hurricane Season: a New Level of Activity Ahead? In my recent post 2011 Atlantic Hurricane Season: an Empirical Assessment I shared some thoughts on the relative inactivity during the first seven weeks of the 2011 season, based on my observations thus far. Now, here I am just one week later observing signs of new levels of activity in the various components of the larger Atlantic basin. Does this mean Mother Nature is shifting into a higher gear as various triggers and factors, all potential contributors to cyclogenesis, appear to have become better coordinated in recent days? This potential recent change in the level of activity of the 2011 Atlantic Hurricane Season illustrates the need for a continuum of predictive efforts rather than relying on seasonal forecasts, such as those issued by folks in Colorado early in the calendar year to be subsequently reviewed prior to or early during the season, which are truly of little value for preparedness and mitigation purposes despite their anecdotal flavor. In my opinion, the possibility for a new and higher level of cyclonic activity just ahead reinforces my thinking along the following lines: (a) one of the constants in nature is continuous change; (b) cyclogenesis is driven by the conjunction of numerous factors and external triggers, some of which act over long distances, influencing the coupled ocean-atmosphere at a specific point in time, that constant monitoring is required for effective forecasting and prediction; (c) to be effectively useful hurricane prediction must be relevant at the local level. * Hurricane Alley is now populated by a more continuous chain of tropical waves, while also following a track that has shifted ever so sightly northward, which takes them toward the Lesser Antilles and the Caribbean rather than through the northern portion of South America. This increases the potential for cyclogenesis to occur in sub-basins of the Atlantic with a higher probability of affecting interests in the Caribbean, Gulf and USA Atlantic regions. * Surface waters have become quite warmer along Hurricane alley, the Caribbean and especially in the Gulf, raising the potential for cyclogenesis in any of those sub-basins.